Reactor fuel rods are fully immersed in water kept at 15 MPa pressure so that it does not boil at the normal (220 to over 300 °C) operating temperatures. Water in the reactor serves both as a coolant and a moderator which is an important safety feature. Should coolant circulation fail, the neutron moderation effect of the water diminishes, reducing reaction intensity and compensating for loss of cooling, a condition known as negative void coefficient. Later versions of the reactors are encased in massive steel pressure shells. Fuel is low enriched (ca. 2.4–4.4% 235U) uranium dioxide (UO2) or equivalent pressed into pellets and assembled into fuel rods. Reactivity is controlled by control rods that can be inserted into the reactor from above. These rods are made from a neutron absorbing material and, depending on depth of insertion, hinder the chain reaction. If there is an emergency, a reactor shutdown can be performed by full insertion of the control rods into the core. Construction of a VVER-1000 reactor vessel at Atommash. Reactor vessel: Water flows through the fuel rod assemblies which are heated by the nuclear chain reaction. Volume compensator (Pressurizer): To keep the water under constant but controlled pressure, the volume compensator regulates the pressure by controlling the equilibrium between saturated steam and water using electrical heating and relief valves. Steam Generator: In the steam generator, the heat from the primary coolant water is used to boil the water in the secondary circuit. Pump: The pump ensures the proper circulation of the water through the circuit. To provide for the continued cooling of the reactor core in emergency situations the primary cooling is designed with redundancy. Steam Generator: Secondary water is boiled taking heat from the primary circuit. Before entering the turbine remaining water is separated from the steam so that the steam is dry. Turbine: The expanding steam drives a turbine, which connects to an electrical generator. The turbine is split into high and low pressure sections. To prevent condensation (Water droplets at high speed damage the turbine blades) steam is reheated between these sections. Reactors of the VVER-1000 type deliver 1 GW of electrical power. Condenser: The steam is cooled and allowed to condense, shedding waste heat into a cooling circuit. Deaerator: Removes gases from the coolant. Pump: The circulation pumps are each driven by their own small steam turbine. To increase efficiency of the process, steam from the turbine is taken to reheat coolant before the deaerator and the steam generator. Water in this circuit is not supposed to be radioactive. The tertiary cooling circuit is an open circuit diverting water from an outside reservoir such as a lake or river. Evaporative cooling towers, cooling basins or ponds transfer the waste heat from the generation circuit into the environment. In most VVERs this heat can also be further used for residential and industrial heating. Operational examples of such systems are Bohunice NPP (Slovakia) supplying heat to the towns of Trnava (12 km away), Leopoldov (9.5 km away), and Hlohovec (13 km away), and Temelín NPP (Czech Republic) supplying heat to a nearby town 5 km away. Plans are made to supply heat from the Dukovany NPP to Brno (the second-largest city in the Czech Republic), covering two-thirds of its heat needs. The two VVER-440 units in Loviisa have containment buildings that fulfil Western safety standards. Fuel pellets: Radioactive elements are retained within the crystal structure of the fuel pellets. Fuel rods: The zircaloy tubes provide a further barrier resistant to heat and high pressure. Reactor Shell: A massive steel shell encases the whole fuel assembly hermetically. Reactor Building: A concrete containment building that encases the whole first circuit is strong enough to resist the pressure surge a breach in the first circuit would cause. 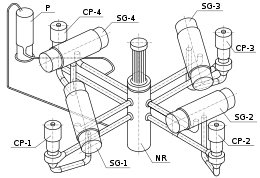 When first built the VVER design was intended to be operational for 35 years. A mid-life major overhaul including a complete replacement of critical parts such as fuel and control rod channels was thought necessary after that. Since RBMK reactors specified a major replacement programme at 35 years designers originally decided this needed to happen in the VVER type as well, although they are of more robust design than the RBMK type. Most of Russia's VVER plants are now reaching and passing the 35 year mark. More recent design studies have allowed for an extension of lifetime up to 50 years with replacement of equipment. New VVERs will be nameplated with the extended lifetime. In 2010 the oldest VVER-1000, at Novovoronezh, was shut down for modernization to extend its operating life for an additional 20 years; the first to undergo such an operating life extension. The work includes the modernization of management, protection and emergency systems, and improvement of security and radiation safety systems. The VVER-1200 (or NPP-2006 or AES-2006) is an evolution of the VVER-1000 being offered for domestic and export use. The reactor design has been refined to optimize fuel efficiency. Specifications include a $1,200 per kW electric capital cost, 54 month planned construction time, and expected 60 year lifetime at 90% capacity factor. The VVER-1200 has a gross and net thermal efficiency of 37.5% and 34.8%. The VVER 1200 will produce 1,198 MWe of power. The first two units are being built at Leningrad Nuclear Power Plant II and Novovoronezh Nuclear Power Plant II. More reactors with a VVER-1200/491 like the Leningrad-II-design are planned (Kaliningrad and Nizhny Novgorod NPP) and under construction. The type VVER-1200/392M as installed at the Novovoronezh NPP-II has also been selected for the Seversk, Zentral and South-Urals NPP. A standard version was developed as VVER-1200/513 and based on the VVER-TOI (VVER-1300/510) design. In July 2012 a contract was agreed to build two AES-2006 in Belarus at Ostrovets for a cost of about $10 billion (Note that this price equates to $4,200 per kW capital cost as opposed to the $1,200 per kW initially cited above). An AES-2006 is being bid for the Hanhikivi Nuclear Power Plant in Finland. On 30 November 2017, concrete was poured for the nuclear island basemat for first of two V-392M units at Rooppur in Bangladesh. In August 2016 the first VVER-1200, Novovoronezh II-1, was connected to the grid and started commercial operation on 27 February 2017. From 2015 to 2017 Egypt and Russia came to an agreement for the construction of four VVER-1200 units at El Dabaa Nuclear Power Plant. A passive heat removal system had been added to the existing active systems in the AES-92 version of the VVER-1000 used for the Kudankulam Nuclear Power Plant in India. This has been retained for the newer VVER-1200 and future designs. The system is based on a cooling system and water tanks built on top of the containment dome. The passive systems handle all safety functions for 24 hours, and core safety for 72 hours. Other new safety systems include aircraft crash protection, hydrogen recombiners, and a core catcher to contain the molten reactor core in the event of a severe accident. The core catcher will be deployed in the El Dabaa Nuclear Power Plant build. VVER-TOI is aimed at development of typical optimized informative-advanced project of a new generation III+ Power Unit based on VVER technology, which meets a number of target-oriented parameters using modern information and management technologies. The first VVER-TOI will be unit 1 of the Kursk II Nuclear Power Plant. 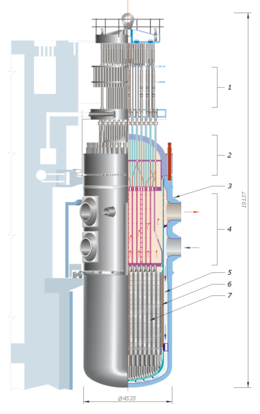 VVER-1700 Supercritical water reactor version. VVER-600 two cooling circuit version of the VVER-1200 designed for smaller markets, authorised to be built by 2030 at the Kola Nuclear Power Plant. (AES-2006 with TOI-Standard) Under construction. (2 × VVER-1000/320) Units 5 and 6 construction suspended. Belarusian Belarus (2 × VVER-1200/491) Two VVER-1200 units under construction. (3 × VVER-1000/528) A version of the V-320 adapted to the Bushehr site. Unit 2 and 3 planned, unit 4 cancelled. Dukovany Czech Republic 4 × VVER 440/213 Upgraded to 502 MW in 2009-2012. Hanhikivi Finland 1 × VVER-1200/491 Construction start expected for 2017. (2 × VVER-1000/392B) Units 3 and 4 construction suspended. (2 × VVER-1000/412) (AES-92) Unit 1 operational since 13 July 2013; Unit 2 operational since 10 July 2016. Units 3 and 4 under construction. 2 × VVER-1000 Older VVER-440/230 units decommissioned 2004-2007. Kursk II Russia 1 × VVER-TOI First VVER-TOI. Leningrad II Russia (2 × VVER-1200/491) (AES-2006) The units are the prototypes of the VVER-1200/491 (AES-2006) and under construction. (2 × VVER-440/213) Units 3 and 4 under construction, planned to be operational between 2018 and 2019. (1 × VVER-1200/392M) (AES-2006) The units are the prototypes of the VVER-1200/392M (AES-2006). Unit 2 is under construction. (2 × VVER-1000/320) Units 5 and 6 planning suspended. (? × VVER-1000/428M) Units 3 and 4 under construction, some more units under consideration. (1 × VVER-1000/320) Unit 4 is under construction and planned to be operational in 2017. See the Wikipedia pages for each facility for sources. Russia recently installed two nuclear reactors in China at the Tianwan Nuclear Power Plant, and an extension consisting of a further two reactors was just approved. This is the first time the two countries have co-operated on a nuclear power project. The reactors are the VVER 1000 type, which Russia has improved incrementally while retaining the basic design. These VVER 1000 reactors are housed in a confinement shell capable of being hit by an aircraft weighing 20 tonnes and suffering no expected damage. Other important safety features include an emergency core cooling system and core confinement system. Russia delivered initial fuel loads for the Tianwan reactors. China planned to begin indigenous fuel fabrication for the Tianwan plant in 2010, using technology transferred from Russian nuclear fuel producer TVEL. The Tianwan Nuclear Power Plant uses many third party parts. 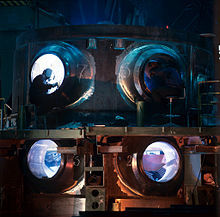 While the reactor and turbo-generators are of Russian design, the control room was designed and built by an international consortium. In this way the plant was brought to meet widely recognised safety standards; safety systems were already mostly in place but the previous monitoring of these systems did not meet international safety standards. The new VVER 1000 plant built in China has 94% of its systems automated, meaning the plant can control itself under most situations. Refueling procedures require little human intervention. Five operators are still needed in the control room. On 11 October 2011 an agreement was signed to build Belarus’ first nuclear power plant at Astravyets, using two VVER-1200/491 (AES-2006) reactors with active and passive safety systems. In July 2016, the reactor vessel for unit 1 has hit the ground during transportation, and though no damage was sustained it was decided to be replaced to allay public fears, delaying the project by a year. Unit 1 is now planned to commence operation in 2019. In October 2013 the VVER-1000 (AES-92) design was selected by the Jordan Atomic Energy Commission in a competitive tender for Jordan's first twin reactor nuclear power station. In November 2015 and March 2017 Egypt signed preliminary agreements with Russian nuclear company Rosatom for a first VVER-1200 unit at El Dabaa to start operations in 2024. Discussions continue for final approval. ↑ Martti Antila, Tuukka Lalitinen. "Recent Core Design and Operating Experience in Loviisa NPP". IAEA. Retrieved on 20 September 2011. ↑ (27 Feb 2013). "Bulgarian Parliament Votes to Abandon Belene Nuclear Plant". worldnuclearreport.org. Retrieved on 22 Sep 2014. ↑ Anton Khlopkov and Anna Lutkova (21 August 2010). "The Bushehr NPP: Why did it take so long". Center for Energy and Security Studies. Retrieved on 1 March 2011. ↑ "Генплан размещения первой турецкой АЭС разработают осенью 2011 года (Master plan of placing the first Turkish nuclear power plant will develop a fall 2011)"। Ria Novosti। ২২ আগস্ট ২০১১। উদ্ধৃতি টেমপ্লেট ইংরেজি প্যারামিটার ব্যবহার করেছে (link) Source for "четырех энергоблоков с реакторами ВВЭР-1200 по российскому" or "four VVER-1200 reactors"